Anybody who knows me even a little knows that I am a planner through and through. I love love LOVE making lists and schedules. How much you ask? Well, for example, each week I make a menu of what we’re going to eat, a grocery list, and a to-do list. I even have sub-divided my lists into short term to-dos and long term to-dos! Crossing items off those lists gives me such a great feeling of, not only accomplishment, but I think also security. In my mind I’m valuable because I have done something notable. Even if it was just emptying the dishwasher, it was something written down and set to be done. And I DID IT. Good job Nikki! Now I know it doesn’t mention anything in there about to-do lists, but I think that falls under the “anything else in all creation” category. The thing that stands out to me about this verse right now are the first four words. For I am convinced…am I? Do I really believe that no matter what I do or don’t get done today I will still be immensely loved by my Father? Well on days when I do get a lot done, sure I am convinced, because I feel good about myself. But on those sad, bad days when nothing seems to go right, or when I just can’t get going and motivated, those days when my list seems daunting and, rather than inspire me, it seems to point an accusing finger at me, I have to say I’m not convinced. On those days, which do happen all too often, I feel worthless, old, tired and discouraged. This last week my brother and sister-in-law came up from Durango for a visit. 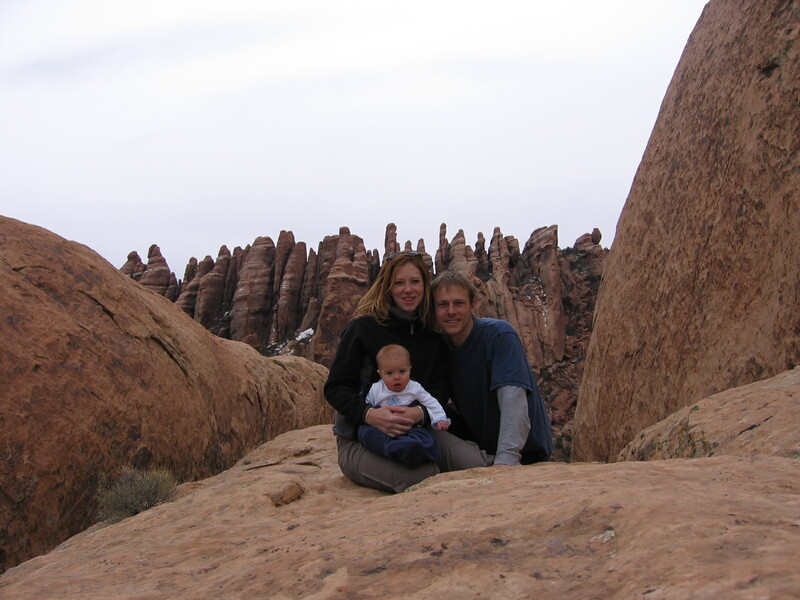 Friday morning we decided to accompany them part of the way home and spend some time rock climbing and hiking in Moab. Then we’d part ways, them heading further south to Durango and us back home. Moab is about 4 hours from our home and an incredible place. We enjoyed the brisk afternoon weather, sunny but still chilly, as we hiked through winding canyons with sandstone towers rising several hundred feet above us. At the end of the hike we were rewarded with an incredible view of the valley. As we ate lunch at the local Wendy’s Kris suggested that we spend the night and then have some more time playing Saturday morning before we headed home. As he jogged across the street to check out hotel rates, a battle began to rise inside of me. The list-making part of me panicked. We haven’t planned for this! We didn’t schedule this! We don’t have any extra food, clothes, or really anything to spend the night! But then a little part of me was excited. What a fun little adventure! We can “rough it” for one night and then enjoy this beautiful place a little more. I think I hid my internal battle fairly well. Kris came back and said there were very few rooms left in Moab due to a half-marathon event that weekend. If we wanted a room we needed to make a decision quickly. My first (internal) response was relief, this would be easy to get out of. I played the religious card and suggested that we go on our outing and then decide afterwards if we wanted to spend the night or not. If a room was still available then we’d know we were supposed to stay. If it was “God’s will”, in other words, a room would be held for us. Kris shot that idea down quickly, his logical mind calculating that it would be very unlikely that we’d come back and find an available room. “Okay, whatever you think is best is fine with me, Kris.” I said, trying to sound convincing. Deep down the list making Nikki was losing and she knew it. The spontaneous, adventure craving Nikki was rejoicing at this opportunity. Kris quickly made a phone call and reserved one of the last available rooms in Moab. This seemingly little decision ended up being the beginning of a huge revelation for me. That night as we settled into our hotel I felt young and giddy. I was excited as Kris went to the store to buy toothbrushes and I washed out our clothes in the bathroom sink with hand-soap. I know there’s nothing all that daring or crazy about what we were doing. But I realized that sometimes my desire to have things planned and scheduled can rule out a certain element of fun and adventure. The revelation continued Saturday morning when we got up and drove out to Arches National Park. We spent the next five hours on a strenuous, beautiful, breath-taking hike. We saw incredible natural arches and sculptures, some that may only exist for a little while longer before succumbing to gravity and erosion. Repeatedly aloud and silently I thanked God for making all the beauty that surrounded us and for giving us the pleasure of being able to see it. I thought a lot about the last twenty-four hours as we hiked and felt like God was showing me how much he loved me in that hike. I had not accomplished a single productive or notable thing since we left home but oh, how blessed and loved I felt. God loved me enough to inspire my husband to extend our stay so that He could take me out into His creation and speak to me about how silly those lists really are. Yes, He made me to be a planner and a list-maker. But He didn’t make me to derive value, blessing, my sense of purpose, or even really pleasure from my lists and plans. He wants me to come to Him for that, and really that’s the only place where my pleasure and true value will ever come from. I’ll never be disappointed when I look to him, in fact, I think I learned from this trip that I’ll end up being amazed. For the rest of our pictures from this trip, click here and video made by Willie. Next Article Happy St. Patrick’s Day and Jennika’s 7 Month Birthday! Wow–what an incredible story. Thank you for sharing! What a great lesson–oh boy am I ever in with you. What an efficient scheduler I am! I’ve always always admired how you are willing to be an adventurer for Kris. I love how God used that willingness in order to bless you so much. Praise God for this testimony! I love your life lessons. It makes me want to cry that you say you feel “worthless, old, tired and discouraged.” Oh sister! How very valuable you are, not only to Jesus, but to your family(I love you so much!) and to your friends that you encourage and bless. Never Ever! Believe the lies that you are worthless(you are a treasure to all who know and love you), never feel old (because you’re not! you are always years young, and young at heart), it’s ok to be tired sometimes 🙂 but when you’re discouraged , well it’s ok to be discouraged sometimes too, but remember Romans 5:3-5. I love you sisser Butterturtle. You are a gifted writer and I love seeing your heart.